Hi, Guys all we know about the Reliance Jio sim. With the help of Reliance Jio sim you have to use free Internet, voice calling and free sms pack which is valid for 3 months. Most of the users complain that they don’t get proper downloading speed during using the Reliance Jio sim. In this guide we have to discuss few quick ways how to increase Reliance Jio 4G downloading speed on your phone. There are lot of tips and tricks available on the Internet which claim that after using these tricks you can get better downloading speed. But few tips and tricks are not working properly, so we have to discuss few important working tricks in this article. You can easily increase Reliance Jio 4G downloading speed on your phone. After reading this guide you can easily increase Reliance Jio 4G downloading speed up to 5-20mbps. Let’s start how these given methods we have to use on smartphone. This is first and easy to use trick which helps you increase Reliance Jio 4G downloading speed on your handset. You just have to take few given simple steps to do this job. Step 1: Download UC mini browser from Google Play Store. Step 2: Install UC mini browser on your phone. After complete the installation open the UC mini browser an start downloading any Apps, Videos, APK and other thing on your phone. Now Pause the downloading and open Snap VPN and connect it to the “Indian” server and resume downloading. Step 3: Again pause the downloading and open Snap VPN and disconnect VPN and re-connnect with “France” server. Step 4: Pause the downloading and open Snap VPN and disconnect VPN and again connect to “Indian” server. Now you can check your downloading speed, it’ll be increased. Note: If you still does not get increase downloading speed then disconnect VPN from “Indian” server and connect to “Singapore” server and again set to “Indian” server. It is another important method which helps you to increase Reliance Jio 4G downloading speed. If you don’t have VPN then you have to add this trick to get increased Reliance Jio 4G downloading speed on your phone. Step 1: You have to add at least 10-15 torrent files and allow all torrent files to start downloading at the same time. You must have to remember don’t try to pause any torrent file if you want to cancel any torrent then tap on the cancel button. Step 2: Check your network connection. If your network signals are poor then you are not able to get high downloading speed but you have proper or full network signals then you will get high downloading speed. You also have to configure settings in your phone to get increase Reliance Jio 4G downloading speed. Step 3: Tap on “Settings” on your phone and click on “More” and select “Mobile Networks“. Step 4: Click on “Access point name” of Reliance jio sim and then click on menu option which is placed on the corner of right hand side and choose new apn. Now you have to set given setting and after that click on the save option. Note: Not Set – There is no need to change the settings at all those location where you see “Not Set”. 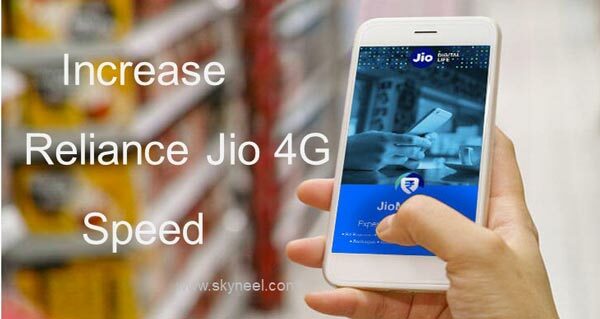 I hope after reading this guide you will be able to use given quick ways how to increase Reliance Jio 4G downloading speed. If you have any query or suggestion regarding this article then please write in the comment box. Thanks to all.